Apart from the FULL COLLECTION that comes with a total of 21 presets, I created three different preset collections that come with seven presets each that are all named individually. The F, P or T always stand for what collection the preset belongs to (F=FOOD, P=PEOPLE, T=TRAVEL) and the word/s after the underline always tells you what kind of photos they generally look best on. So for example; the preset F_GREENS stands for: F= Food and GREENS= for photos with green ingredients like salad, cucumber, avocado and whatever green-colored food there is; the preset T_FOREST stands for: T= Travel and FOREST= for photos with forests, trees etc. on it. 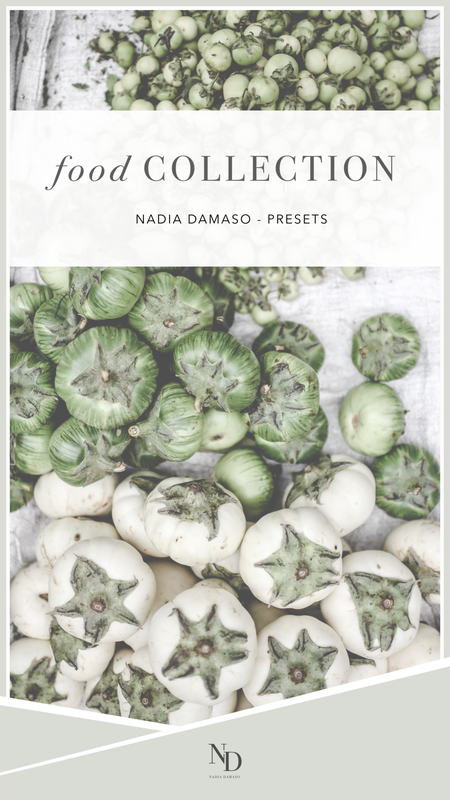 While creating the presets and testing them on hundreds of my photos, I also realized that in many cases a preset from the food collection, for example, works wonders and looks beautiful on a people or travel photo and vice versa. So if you want to have full access to all presets and test them on various kinds of pictures, I highly recommend you to get the FULL COLLECTION that includes all three collections with a total of 21 presets. But simply see for yourself what you like and check out the individual collections below.